Like many parents, we make hand-made costumes for our kids instead of buying cheaply-made (and expensive) costumes based on licensed characters. This year, my youngest son wanted to be a robot. My wife did a great job making the costume, but I just had to add some cool electronics to take it to the next level. 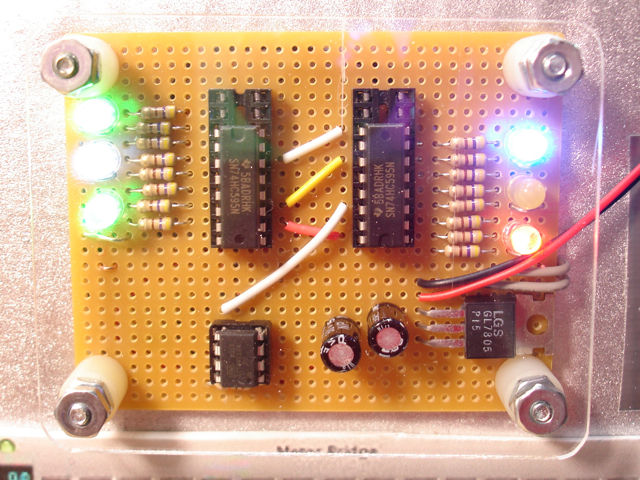 The electronics are nothing fancy — a simple Atmel ATtiny13 microcontroller that interfaces with two 74HC595 shift registers to light up LEDs randomly. The technical details are below, but in the process of building this, I was really struck by how electronics and computing are being embedded into everything. This week I was making a TODO list and one of the items was “finish source code for robot costume”. OMG, now the costumes we make have source code. This is a great example of how technology is becoming increasingly ubiquitous. Ten years ago, this would have been far beyond my reach. But in 2010 I can build this easily. The microcontroller cost $1.04, the shift register chips are $0.25 each, the resistors are a penny each, and the LEDs probably average $0.20 each. Definitely less than $5 for everything. Here is a closeup of the circuit board. There is a piece of clear acrylic protecting it. I ran out of 16 pin IC sockets, so the shift registers are in 20 pin sockets. Circuit on front of costume. ATtiny13 microcontroller and two 74HC595 shift registers. And finally, the simple source code that runs on the chip. 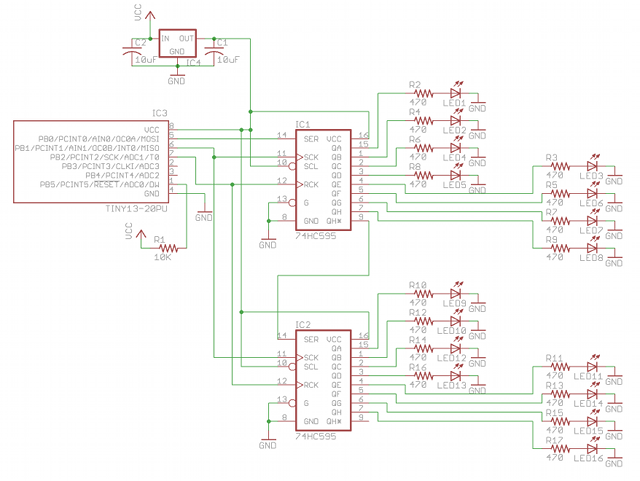 I use CrossPack for AVR development. 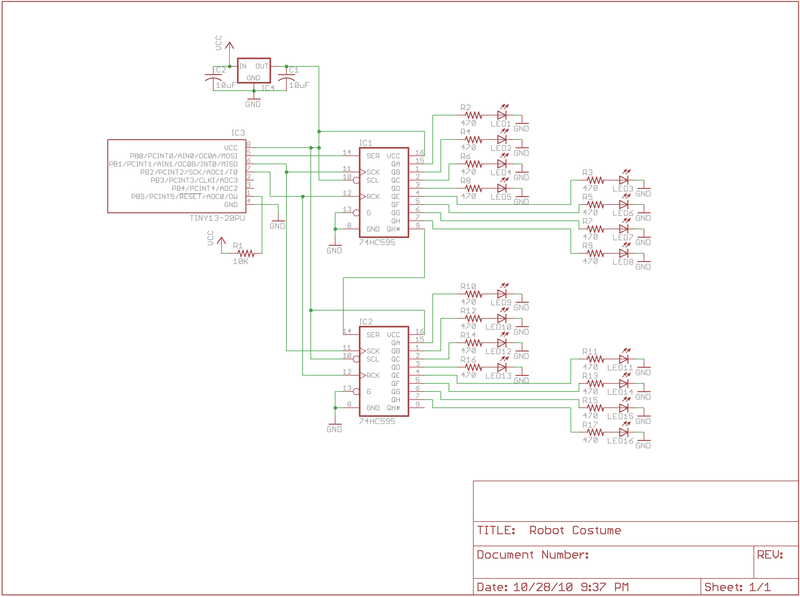 I use avrdude and a Bus Pirate to upload the code onto the ATtiny13 chip. // choose number of LEDs to light up. // constant value, not a variable!